Tanzania, Africa – my alarm goes off at 5:45am, it is still dark out there and I’m freezing. I had completely underestimated the weather and forgot about the vice verse seasons. Summer in Europe = wintertime in Tanzania. And camping at approx. 2500m didn’t help. Two sleeping bags were hardly enough to keep me warm during the night. I might have shivered myself through the night. Anyways, that’s part of the adventure and as long as my sinuses were fine so was I. Imagine someone crawling out of a tent wearing all the clothes they brought for a multiple day trip, frizzy hair, not really awake yet: Yep! That’s me – say hi! As yesterday’s showers were freeeeezing, we all had decided to not shower today. Still my hair needed a little touch up so I stepped into the dark shower cabin with hardly any light – probably for my best. Turning on the shower surprised me quite a bit – delicious hot water! You can tell I was not cold anymore! After another great breakfast we headed off with Philamon, our lovely tour guide and driver for this trip. While he arranged the entrance tickets to the Ngorongoro National Park we had some time to pass. 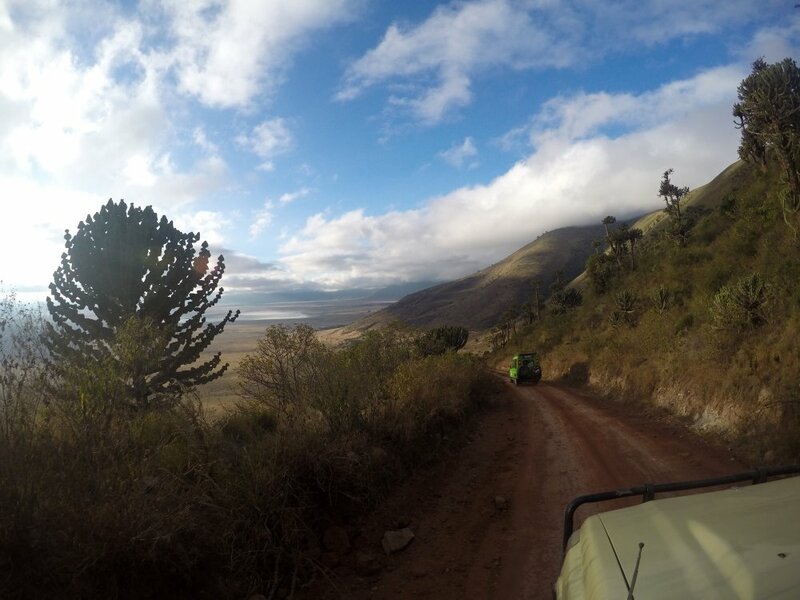 We didn’t stay in the car, because the view into the crater was simply breathtaking. We were standing on the crown of the crater and looked down into the national park. Some clouds added a sense of mystery to the scenery. 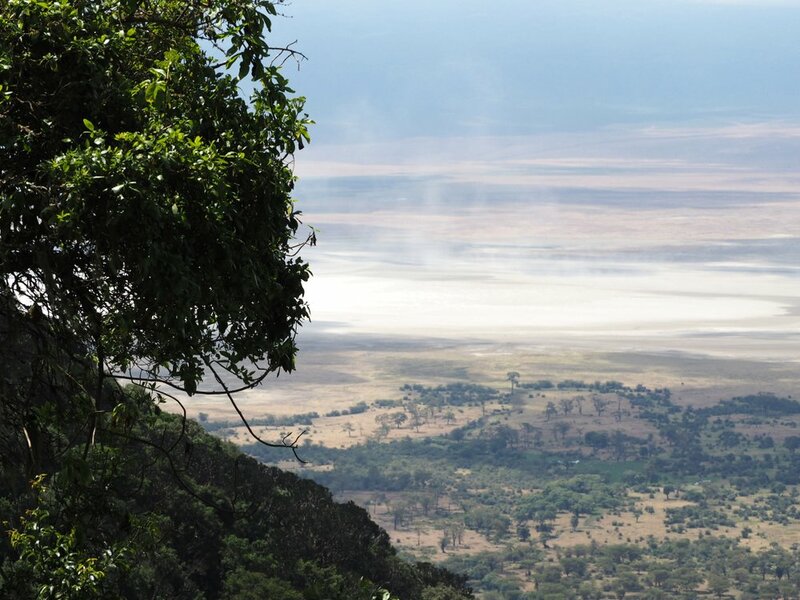 The Ngorongoro was once the highest mountain in Africa, before it collapsed and left this little world of wonders. You can’t see any lava or anything that you would expect of a typical crater. It is a lowered, enclosed savanna just as any other that is found outside the crater. The radio goes crazy, well crazier than usually – I don’t understand what they are saying, but Philamon sure understands. Without any big announcement we drive away from a spot where we just gazed at beautiful elephants eating very close to the road at a distinct part of the crater. We drive inwards, some other vehicles are already there, and everyone is up on their seats and stares out the open roof. “What do they see”, I wonder. Philamon turns off the car, gets his binoculars and tells us in his calm voice to look out for a lion lying in the high grass not too far away. I need a little while to find said lioness and I stare at her in wonder. I feel so lucky and happy and just content and I could hug the world right now. But this is just the beginning. I turn my head slightly to the right and spot another two lions hiding in the grass. Eventually I keep turning to the right and discover a pack of lions. Wow!! I can’t believe my eyes. 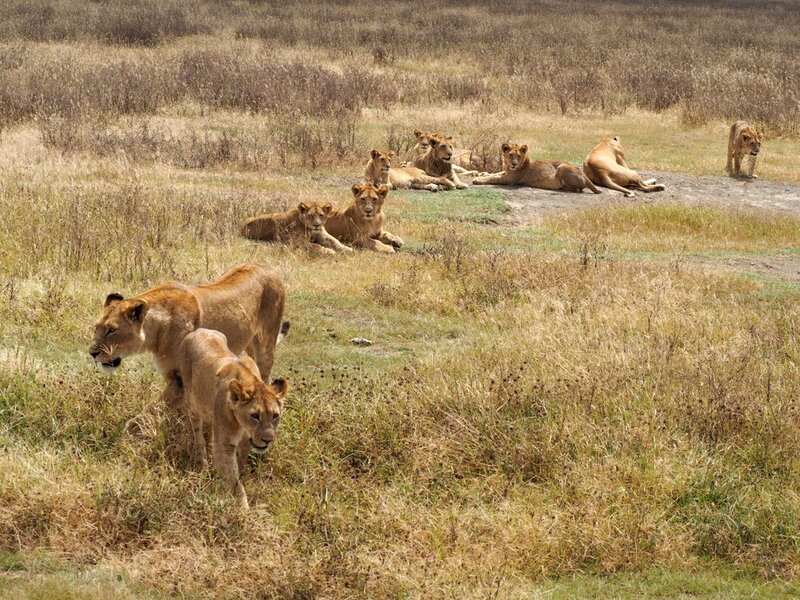 This is something I had wished for in a long time – observing lions and other animals on a safari. I hadn’t thought it would be possible to experience this moment so soon and get lucky as well. It seamed like the world was on hold for the time I looked at every move those lions made. Some of them got up, walked a bit closer to us and hid again in the grass by lying down. The female lion, let’s call her Nala, got up again and got closer and closer to us. She was actually walking directly towards us. Nala came even closer, stopped again, observed the area and continued her way. Philamon had chosen the very best spot to park the 4×4, because Nala was just passing it in front. I wasn’t even 2m away from her! 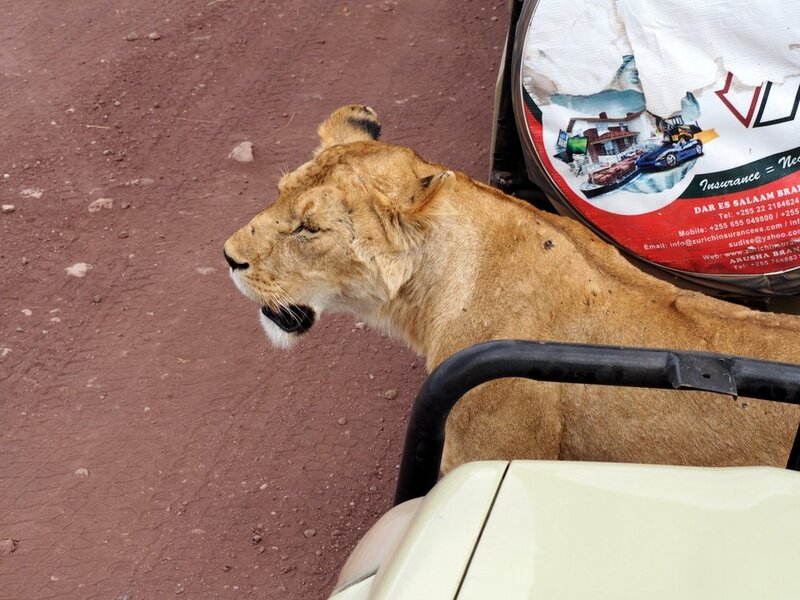 I wanted to climb back into the car, but Philamon assured me that nothing will happen and that the lions will not come after me. I believed him and stayed watching as the lions passed one by one. Some also lied down next to the car in front of us as if they were posing to get some cool pictures. At first I didn’t understand why all those lions wanted to cross the road and get so close to us humans. They must have heard about Cecil’s story. But then I spotted buffalos in the distance and instantly knew what the lions were up to. The lions sneaked closer and closer to the buffalos. The high grass was the perfect camouflage for the hungry animals. Even with binoculars they were hard to spot and keep track of. They started spreading to cover a larger area and get ready for their attack. They sneaked further and further ahead – raising only their ears and tail above the grass to communicate. In the meantime the buffalos didn’t sense anything and continued their morning grass snack in peace. Then suddenly the lions started their attack. They tried to isolate a single buffalo to take down. It seemed to work at first but then the other buffalos joined the one singled out by the lions and made the attack unsuccessful. The lions didn’t give up after their first try and started a second attack. This time they couldn’t even separate the buffalos, which seemed to get annoyed by the attacks. So they started a counterattack and tried ramming their horns into the lions. One lion didn’t get so lucky as it was too slow and got hit by the buffalo so hard that it got catapulted high in the air. For this amazing adventure I chose an amazing tour operator called Absolute Africa – and yes they are absolutely Africa! Their safaris are budget camping safaris, while the quality and love they put into their tours is almost unbearable! From the very first email till the end when I left Tanzania, they helped me arrange things in Kenya and gave me useful tips! Watch out, I’ll be back! Note: This trip was part of my Traum.Welt.Reise – “Around the World in 72 Days” project with Marco Polo and Marco Polo TV this summer. Very interesting article. You’re so great and brave person to take that amazing shots between the Lions and Buffalos. Keep up the good work! Oh I was still in the Safari van, I wouldn’t leave that for anything! But still it was so breath taking! Great adventure Viki! You’re an inspiration to many people who like to travel the way you do! I would love to have a close encounter with those lions too! 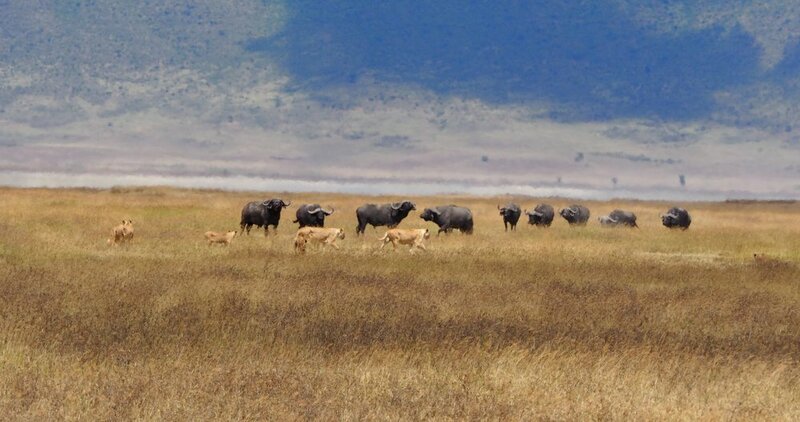 The Ngorongoro Crater national Park is a wonderful venue for animal lovers like me! Hey Mandy! It was a very special trip and I can recommend going on a Safari deeply – although it costs a fortune, but those images will be forever in your head!